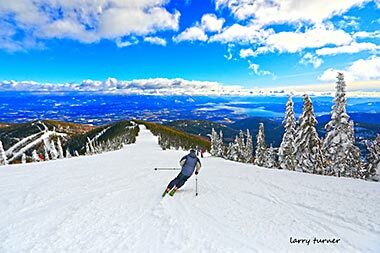 Nestled in the Selkirk Mountains of Idaho’s panhandle, overlooking 143-square-mile Lake Pend Oreille (ponderay), exists a wondrous find of deep snow, challenging terrain and fabulous vistas. 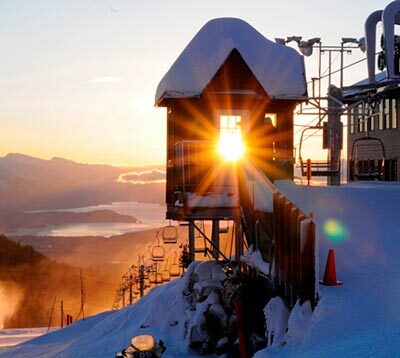 In a region known for its outdoor opportunities and laid-back style of living, the secret of Schweitzer Mountain Resort is still largely undiscovered. 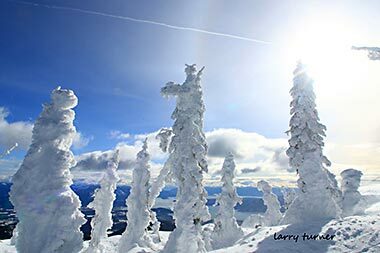 From Schweitzer’s 6,000-foot-plus ridgeline, sprawling views include Canada, three States, three mountain ranges, and 1,150-foot-deep Lake Pend Oreille. 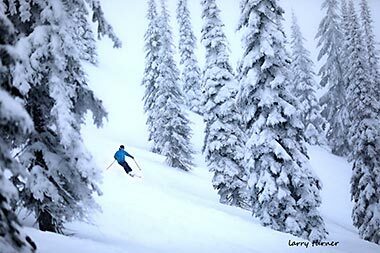 Cold, moisture-laden storms driving down from the North dump massive amounts of dry snow, averaging 300 inches a year. The view from the extensive ridge line encompasses countless lakes and three mountain ranges - the Selkirks, Bitterroots and Cabinets - in Idaho, Montana, Washington and Canada. The first known white men to trek these slopes in the early 1900s were French Canadian fur trappers. 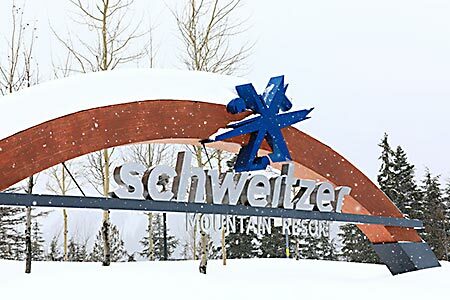 The Mountain’s namesake was an old Swiss hermit who lived and trapped at the bottom of Colburn Basin - the German word “Schweitzer” means “Swiss man.” Folks began skiing here in the mid-1930s, but it took a few years before a lumber entrepreneur recognized the potential for ski development. 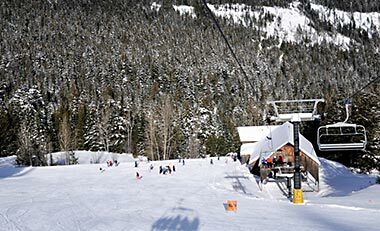 After a hectic summer of construction, in November 1963, Schweitzer Basin Ski Area opened the doors of its day lodge and cranked up a mile-long double chairlift transporting skiers from the parking lot to the top of Schweitzer Ridge. 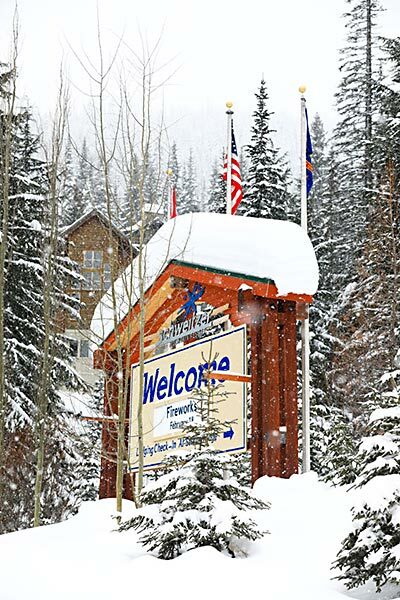 The area was a success, but was still under the radar of the booming ski industry. 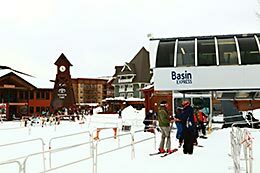 In the early 1970s, they expanded into Colburn Basin, and by the mid-70s had added more lifts, a new day lodge and on-site lodging. 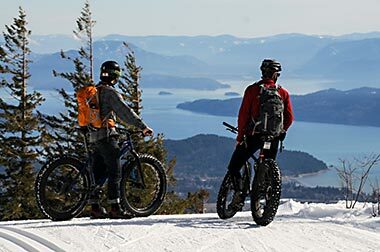 The 80s brought them into year-round mountain resort mode when they began hosting a summer concert series, ran scenic chairlift rides, developed hiking trails, and added mountain bike rentals. A 10-year, $100 million master plan was unveiled in 1990, and over the next year, 300,000 hours of labor was expended constructing a new day lodge, hotel and detachable quad. The quantity of lumber used could have built a boardwalk from Seattle to Spokane. 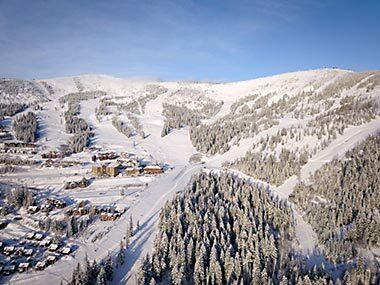 Schweitzer’s biggest blessing, beyond its abundant snow and exceptional terrain, is the fact that it is built on 100% private land so they don’t have to smooch any tushies to get things done. 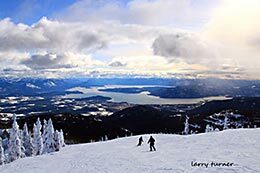 The Basin Express Quad heads up Schweitzer Bowl to the Lakeview Triple Chair (center), with views of the Village and Lake Pend Oreille. 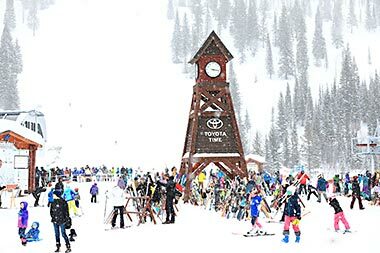 Schweitzer and Outback Bowls are two expansive and delectable playgrounds with a vast array of terrain that includes powder chutes, gladed runs and a variety of cruisers. 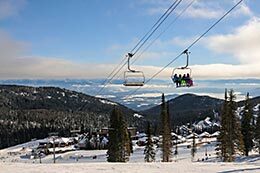 Runs in Schweitzer (a.k.a. South) Bowl are accessed off South Ridge, Gypsy and The Great Divide, providing a choice among plummets down the likes of White Lightening, heart-pounding thrills in A, B (a.k.a. 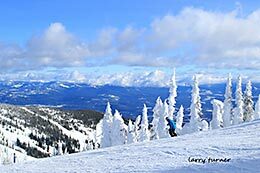 Bud’s) or C Chutes, or a brisk fall-line drop down Stiles, named for Spokane-based and Schweitzer regular Dr. Merritt Stiles, then President of the American Ski Association and member of the U.S. Olympic Committee. 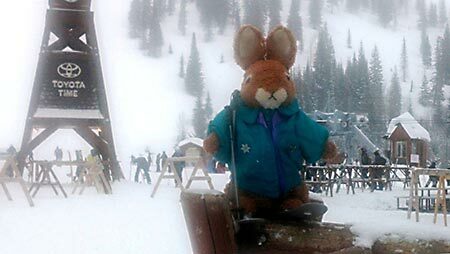 Less adventurous snowsliders will enjoy the more open slopes of Ridge Run, Quicksilver and Jimmie’s Run. 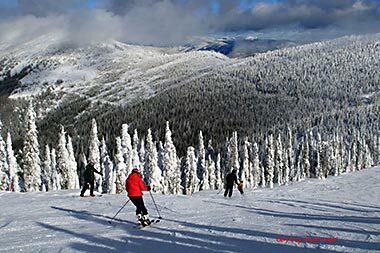 Wind-protected slopes in the Outback, also known as the North Bowl, are a magnet for deep snowfalls where runs like Chute the Moon and Kohli’s Big Timber plunge down the fall-line between stands of old growth hemlock. 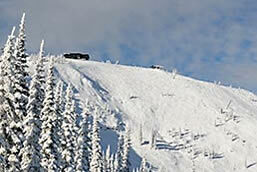 The Bowl starts with a 1,000-foot plummet off the ridge, transitioning to cruisers the last 1,400 feet to the bottom. Start with Upper Kaniksu, veer onto Downhill Run, then wind along Snow Ghost for a frolicking combination of challenge followed by a waltz to the bottom of Colburn Basin. 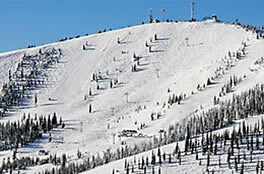 A menagerie of blues, blacks and double-black runs keeps everyone happy, adrenaline junkies and families alike. 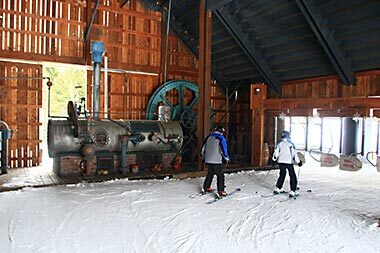 The Carriage Barn serves as the loading station for Stella, Idaho’s only six-pack lift. 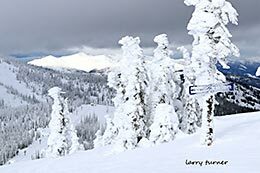 At the bottom of the Basin you’ll find Stella, Idaho’s only six-passenger lift, servicing an array of cruising terrain as well as a trio of fun gladed stashes: Glade-iator, Kathy’s Yard Sale and the 75-acre Phineas’ Forest. Stella transports riders back in time as you enter the loading station, housed in a Cable Carriage Barn complete with 19th century Inventor’s Workshop that includes steaming boilers and whirling gears. Stretching a mile up the mountain and ascending over 1,500 vertical feet, riders are transported to the top in just five-and-a-half minutes. Sunrise from the top of Musical Chairs. Just downslope from the Village Plaza, the double-seater Musical Chairs provides the perfect environment for neophytes to develop their ski and board legs on Happy Trails and Enchanted Forest. The Musical Carpet surface conveyance is adjacent to a terrain park with small features, just right for beginning park riders to get a feel for this type of winter frolic. 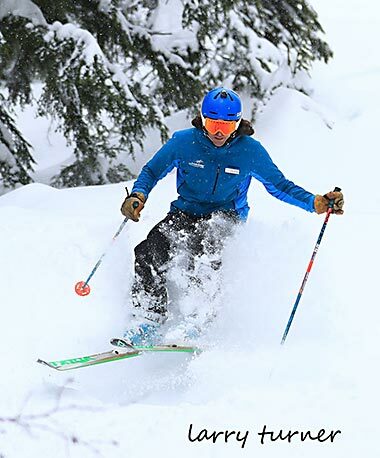 Schweitzer’s 2,900 skiable acres includes terrain of every variety: smooth corduroy groomers, wide open bowls, gladed runs, and near-vertical chutes. Park riders loop the Basin Express quad to access the Stomping Grounds and Southside Progress Terrain Parks. Medium-sized features in the Progression Park are a great place to learn new tricks or warm up for the full-sized jumps and jibs of the Stomping Grounds, where a Park Pass is required for entry. Initiated to educate users about safety and ease congestion in the Stomping Grounds, the Park Pass is easily obtainable online: watch a safety video, take the quiz, and pay $5 online or at the ticket office for a pass good all season. 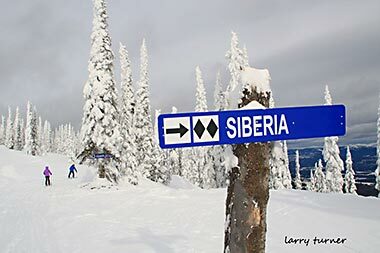 Nordic devotees have over 32 kilometers of groomed and track set trails, ranging from gently rolling paths to rigorous uphill grinds. The 8-km Overland Trail loop leads to numerous side trails as it skirts the fringes of the cross country trail system with a gentle 550-foot elevation gain. GRR Trail, a 5-km loop with a 320-foot elevation rise, leads to Picnic Point’s picturesque view. Howling Rock Haul is an invigorating 11-km trek with some dramatic vistas. Nearly 10 km of snowshoe trails weave throughout Hermit’s Hollow, offering an opportunity to see wildlife skittering through the forest. Cross country trails are also open to snowshoers and, when the trail is hard packed, snowbiking, but no dogs please. 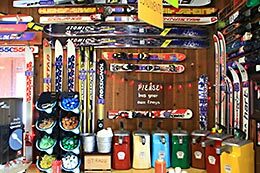 Cross country gear, snowshoes and snowbikes are available for rent. For a different type of sliding downhill, Hermits Hollow Tubing Center offers two groomed lanes stretching over 100 yards, followed by a relaxing tow back up the hill. Day and night sessions are available, as well as Twilight Skiing weekends and holidays on the Basin Express quad and Musical Chairs. 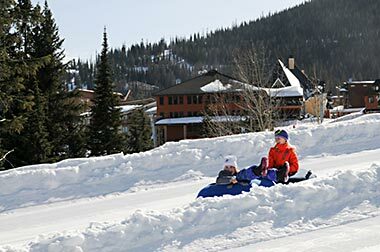 If you prefer to be indoors, the Selkirk Lodge Movie Theater runs three family-friendly features a day, open to all Schweitzer visitors and at no charge. Solstice Spa, also located in the Selkirk, offers a variety of therapies perfect for unwinding and relaxation. Especially relaxing is the Hot Stone Massage after a day of tackling this amazing mountain. Night casts a magical glow over the Village Plaza area, while the lights of Selkirk Lodge’s pool and hot tubs glow in the dusk. View of White Pine Lodge from the author’s room at Selkirk Lodge (image by Vicki Hoefling Andersen). 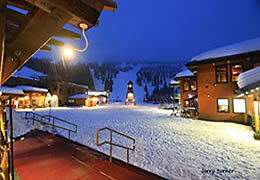 Both the Selkirk Lodge and White Pine Lodge are ski in/ski out properties located in the Village. 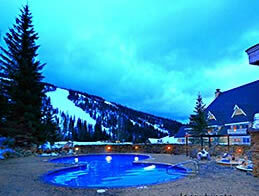 Selkirk Lodge features hotel-style accommodations with a variety of room types, three outdoor hot tubs and a heated pool. White Pine Lodge with their kitchen units is a great upscale choice for families. A variety of on-mountain private condos are also available for rent, or, for a small fee, you can park your self-contained RV. The Sky House sits on the Great Divide between both Bowls, the Lakeside Chutes front and center in the image on the left. An appropriately decorated condiment bar at the Outback Inn. On-mountain options include hot food, cold beverages and a baked potato bar (this is Idaho, after all) at the Outback Inn in the Outback Bowl. 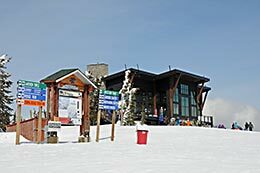 Sky House, a two-story, view-packed lodge perched at the summit, with a full service bar and small plate options in The Nest or salads, soups and hot grab-to-go items in the Red Hawk Café. In the Village you can chose among Chimney Rock Grill (fireside dining from burgers to steaks), Mojo Coyote Café (sandwiches), Lakeview Café (cafeteria-style breakfast and lunch), Pucci’s Pub (for locals’ flavor), Taps (great aprés-ski), Sam’s Alley (pizza), Cabinet Mountain (coffee), and Gourmandie (light bites). (image by Vicki Hoefling Andersen).